It’s hard to believe, with all the terrible weather we’ve been experiencing, but Spring is on its way. The urge and desire to dig out the feather duster and cleaning products to spruce up your household will soon be here. After a thorough spring clean your home feels organised and pristine; it makes you feel motivated, liberated and energised - you fall in love with your home again. A spring clean should apply to the workplace too to keep employees enthusiastic and passionate about their role and their place of work. To keep employees contented, positive and upbeat your workplace culture must be in great shape. Focusing on this is as important as your company’s strategy. Your unique workplace culture shows off your company’s personality and sums up your values, beliefs, style and traditions. It should be considered as the heart of your business and make your employees feel connected to its success. A strong, positive culture will attract talent, drive engagement, improve job satisfaction and result in a workforce of loyal, high performers. Firstly, let’s consider what influences your culture. Well, quite simply, everything! The way management interact with their teams, the hierarchy, the procedures, the objectives, the rewards, the work/life balance, the dress code, the working environment - just to mention a few. The culture must be an honest reflection of your business’s vision and goals. Organisations don’t take their eyes off their strategy and nor should they take their eyes off their culture. So, if you feel you need to freshen up your workplace culture to make it shine once more here’s what you can do. Get To Know Your Workforce. 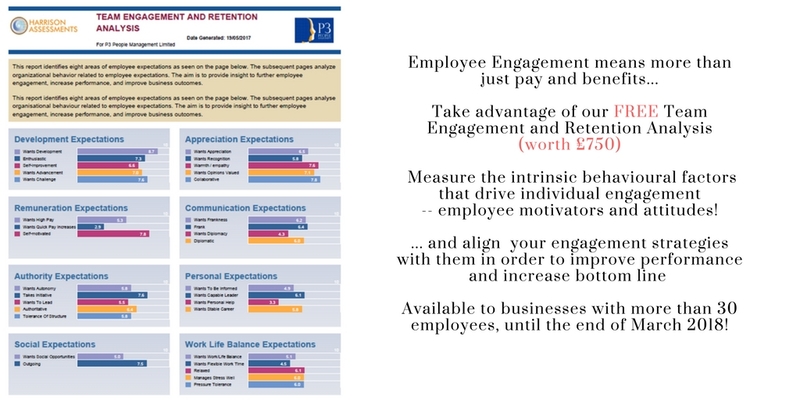 It’s crucial to invest time in Employee Engagement, only through effective engagement can you truly understand exactly what motivates, attracts and retains your teams. Using this knowledge is a great start to review your workplace culture. Meeting the desires and needs of your employees will drive performance, profit, productivity, customer service, retention, innovation and well-being. Recognise Strengths. Managers who hold regular reviews with individuals are equipped to identify strengths and weaknesses. An enviable workplace culture is one that recognises high performers and encourages their growth, it provides learning and development to underperformers so they too can be the best they can. Employees who are nurtured and inspired are likely to stick around and grow with the business. Act On Surveys. Honest, anonymous responses to an employment survey is a great tool to measure engagement. Analysis of the answers will enable you to identify areas where engagement needs to be re-energised to help your organisation achieve sustainable performance. When you listen to the voice of your employees and act on it positively, they remain engaged. Communicate. Hold regular meetings with teams and, when necessary, address whole departments. Don’t keep employees in the dark as this will lead to anxiety and negativity. Keep your workforce informed of future plans and strategies and ask for their opinion too – make them feel a respected part of the company. Be Open. A member of staff shouldn’t fear walking into a manager’s office; management should be open to questions and listen to concerns. Review Your Benefits and Rewards Strategy. A benefits and reward strategy is crucial in today’s competitive workplace and one size does not fit all. Long gone are the days when a salary was enough to attract, motivate and retain an employee; the modern workforce looks for the non-financial rewards too. Recognising their individuality, and understanding what attracts your employees, you will be able to structure desirable packages to include options such as salary exchange which could provide extra holidays, childcare vouchers and health plans for example. Give Praise. This goes without saying, doesn’t it? Go on, start today and tell someone they did a great job and tell them why. Your colleague will appreciate the gesture and recognise that you pay attention to what they do. With a workplace culture in great shape, your organisation will become recognised for excellence and first-class leadership. Now, who wouldn’t want to work there?